I always find November a particularly difficult month. With each day that passes, the world gets colder and darker, and all I want to do is hibernate. It’s why I look forward to seeing the Caledon Hills Bruce Trail Club’s winter hike and event schedules, because they’re always guaranteed to get me out, enjoying fresh air, taking in the sights and sounds of nature, and meeting people. As many of you already know, our hike leaders continue to lead hikes throughout the winter, and our winter hike schedule has been published. Now’s the time to take a look at the Introductory, General, and Tuesday hike pages so you can mark some dates in your calendar to enjoy the outdoors over the next few months. CHBTC’s hikes always give you the opportunity to spend time with old friends and acquaintances, or make new ones. Our annual winter hike and pot luck takes that one step further. Not only do you have the option of enjoying a short hike, but at the potluck portion of the event you can join friends and acquaintances in sharing good food and an engaging presentation about a trip some of our members took in the Yukon. For the cross-country skiers out there, you’ll be happy to hear that the 14 km network of groomed cross-country ski trails will be open again this winter (weather permitting). 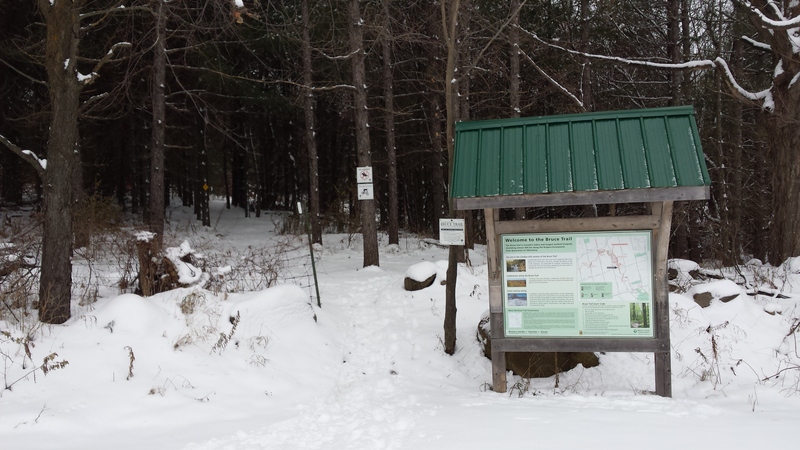 As in past years, a short portion of the main Bruce Trail will be closed to hikers during the ski season, but will be replaced by an alternate route connecting with trails exclusively for snowshoeing. This trail change will be posted on the Bruce Trail Conservancy’s website when it occurs. Remember: skiers must stay on the designated ski trails, and walkers must stay on trails designated for walking. And, if you’re planning to buy a real Christmas tree for this year’s festive season, you’ll be sure to run into some friends and acquaintances at our club’s annual Christmas tree fundraiser at Hockleycrest Farm. You can cut your own or buy one that’s already been cut. Enjoy some warm apple cider while you peruse our selection of boughs, wreaths and planters for sale. Our member volunteers will help you find what you’re looking for. It’s hard to get going in the winter, but one of the easiest ways is to participate in something someone else has already planned. Hope to see you at one of our organized hikes or events! Looking for a Christmas gift idea? Here’s one that will have you giving twice, with a generous portion of the purchase price going to the Bruce Trail Conservancy! We are once again partnering with Theatre Orangeville for our 2019 spring theatre fundraiser. For details on how you can purchase tickets to cross some names off your Christmas list, see our website.